Play in Adair Park this Sunday! Play Day is almost here! This Sunday, September 21st, come to Adair Park II from 1-5pm to play. The Atlanta Beltline and Atlanta ContactPoint are presenting this fun event that includes all types of sports for kids and adults. Activities include hockey, kickball, dancing, softball, lacrosse, basketball, soccer, golf, flag football, martial arts, rugby and an awesome game called dragon goal. They do still need volunteers. You can sign up on their website. Come have some fun in the sun and support this great effort! Check out the ContactPoint website for more information. The Adair Park Youth Lawn Service Program is in full swing! The service is valued at $30 and is done on Tuesdays from 4-8pm. These hardworking Adair Park teens will cut lawns for free for seniors in need. Donations are always welcome as well. Please contact Lloyd Rollerson at 404-988-6322 or via email at lloyd.rollerson@gmail.com for questions, to get on the schedule or recommend a senior in need. Let’s help out the youth of Adair Park! Jamie Johnson wants you! She is leading boot camps in neighboring Capitol View at Perkerson Park, 770 Deckner Avenue, on Tuesdays and Thursdays at 6pm. Jamie is a certified personal trainer and knows a little bit about getting in shape – she lost 92 pounds herself! Check out her page on trainersvault.com for more information and a schedule. Classes are an incredibly reasonable $10! Play Day on September 20th in Adair Park! Come to Adair Park II on Tift Avenue for a play day! Saturday, September 20th from 1-5pm the Atlanta Beltline and Atlanta ContactPoint are presenting this fun event open to anyone and everyone. Play Day is a free day of sports, fitness and health education for the community. There will be local coaches and organizations to facilitate games and drills for a wide variety of activities including flag football, soccer, softball, lacrosse, basketball, hockey, skating, dance, martial arts and more! 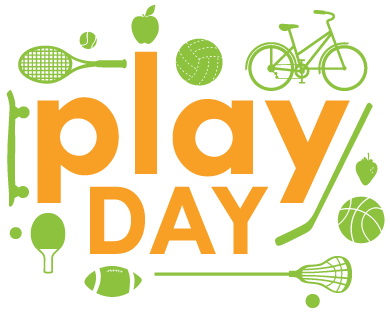 Visit Atlanta ContactPoint’s website for more information, check out the PLAY DAY partners and see the schedule of events. Are you a resident of Adair Park, Capitol View, Capitol View Manor, Pittsburgh or one of the other surrounding neighborhoods? Then this day is for you! On September 20th, a variety of restaurateurs, developers, and entrepreneurs will tour southwest Atlanta. They will meet at 884 Murphy Ave at 9am and head out from there. The purpose of this bus tour is to welcome the visitors into our community, visit multiple sites, introduce them to residents and inspire them to invest their businesses in our iSWAT neighbor-hoods. They will be shown many areas that are prime for redevelopment. From now until September 15th, please take the iSWAT survey to give your views on what you like and would like to see in SouthWest Atlanta. 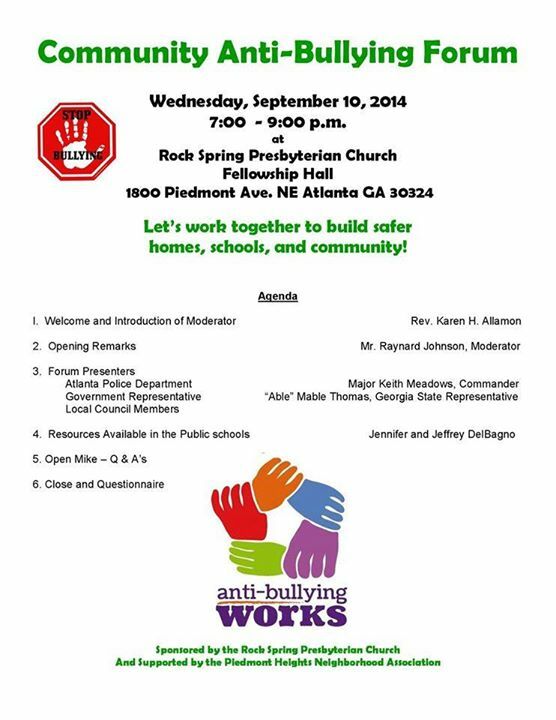 On Wednesday, September 10th from 7-9pm there will be a community anti-bullying forum at the Rock Spring Presbyterian Church at 1800 Piedmont Road, Atlanta, 30324. Presenters include members of the Atlanta Police Department, local Council members and State Representative Mable Thomas. Please see the flyer below for more information and an agenda. Art on the Beltine this Sunday! Come to the entrance to the Beltline on Allene Avenue on Sunday, September 7th for an awesome event! From 2pm to 8:30pm there will be music, dance and fun! Plenty of AP neighbors and those from surrounding communities will be in attendance so come out and enjoy the fun. In addition to the art festivities, Adair Park is teaming up with Capitol View and Capitol View Manor to host a picnic for paid members of those neighborhood organizations. We ask that you bring a side or dessert to share as we will provide a main course and a vegetarian option. Bring your chairs and blankets and enjoy this beautiful community event! 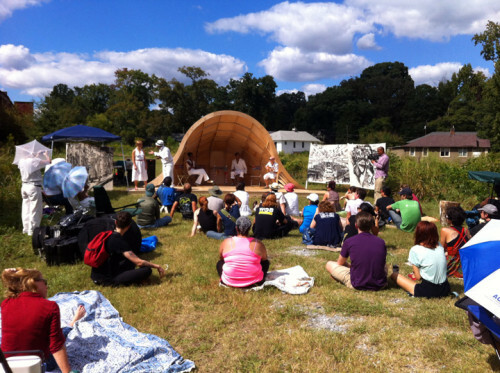 For a complete schedule, visit the Art on the Beltline schedule. In case you missed it, you can view this month’s Adair Park Today newsletter right here on our website. Or, if you are as swamped as we are and cannot always remember to go looking for the newsletter, then sign up to receive it via email every month! Lakewood Community Day September 6th! Join many other Atlanta residents at the Community Day at Aaron’s Amphitheatre at Lakewood on Saturday, September 6th. This fun, family-friendly event starts at 11am and runs until 4pm. There will be live entertainment, children’s activities, food trucks, bounce houses and more.There will also be local non-profits and voter registration tables. Free admission and parking. Come join the fun at the Pryor Road entrance @ Fair Drive. For more information, email aaronsoversightcommittee@gmail.com or call 404-624-6298. Adair Park residents are always on the lookout for new places to eat. Whether it be healthy, ethnic, wings, burgers, fish, etc. – if it is near us, someone in Adair Park has checked it out! First up is Drink Art in Castleberry Hill. Owner/Chef Shandon Anderson (yes, that Shandon Anderson of the UGA men’s basketball team and the Utah Jazz among other NBA teams) has opened this great spot about a mile and a half from Adair Park. Chef Anderson has made some Thai favorites all vegan – including some curries, Pad Thai and fried rice. Several neighbors have been and all report back that the food is delicious and reasonably priced! Check out their menu and stop by soon! Open for lunch and dinner Tuesday through Sunday. Next up is just Bartaco, which is just a little bit further down the road at less than 4 miles from Adair Park. It is located in the popular West Midtown district near 5 Seasons and Bocado on West Marietta Street. This new spot has established locations in New York and Connecticut, and already has plans to open others in Atlanta. Their menu features tacos, small plates and lots and lots of drinks. The patio is really nice and the atmosphere is a lot of fun. They have some great reviews on Yelp and it sounds like a great spot to eat. Check out their menu and stop by soon! If you have any suggestions for a spot near Adair Park, send it to webmaster@adairpark.com.